The Sicilian wine industry is undergoing dramatic changes. Not so long ago Sicily meant Marsala; a fortified wine with associations with Lord Nelson and the British Fleet. Marsala also had dubious connotations for it could be flavoured with eggs, coffee or almonds, to make a vino aromatizzato for cooking, rather than for drinking at the dinner table. Today Marsala producers, led by Marco de Bartoli with his stylish wines like Vecchio Samperi, are trying to recoup their tarnished reputation. But producers of table wine are also attempting to realise the tremendous potential of their vineyards. Sicily is a great place for growing grapes: while it enjoys hot summers with very limited rain, it also has vineyards at relatively high altitudes – up to 700 metres – which benefit from an excellent exchange of day- and night-time temperatures; as much as 15C in the height of summer. Sea breezes too have an important moderating effect. And yet until fairly recently there were really only two producers who put their wine in bottle: the Duca di Salaparuta with the brand name of Corvo, and the aristocratic family of Tasca d’Almerita at Regaleali.The vocation of Sicily seemed destined to be what the Italians call vino sfuso, or bulk wine. Unlike most of Europe, irrigation of the vineyards was allowed and made for too generous yields and wines sent north for blending. Rarely was it sold with any indication of its provenance. You may well wonder why Sangiovese was introduced into Sicily some thirty years ago. The simple answer was to bolster up often pale and insipid Chianti, in the days when the DOC regulations allowed for a generous dollop of white wine in a Chianti blend. Nowadays there is interest in the well-known international grape varieties, with various people attempting to take credit for the early plantings of Chardonnay, Merlot, Cabernet Sauvignon and Syrah some ten or twelve years ago. More often than not, these are blended with indigenous Sicilian varieties, the argument being that no one has ever heard of Nero d’Avola, but if you add it to some Merlot, it helps to establish consumer awareness. 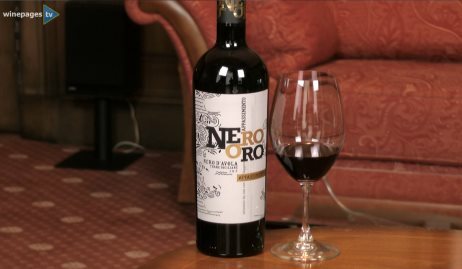 Nero d’Avola is generally recognised as the key red grape variety of Sicily, and much energy is being spent on establishing the best way to grow and vinify it, after years of using it to churn out vino sfuso. Camillo Morgante explained that he was disappointed with his experiments with Cabernet Sauvignon, Syrah, and especially Merlot, for it is simply too hot. Nero d’Avola on the other hand loves the heat; it is quite tricky to grow as it has a tendency to be very productive and vigorous, so that yields need to be strictly controlled. It also dislikes high humidity, but that is rarely a problem in Sicily. And the wines of Morgante show just what can be done with finely crafted Nero d’Avola. 2000 Morgante has ripe, smoky berry fruit with some tannins, while the Don Antonio which spends time in barrique has more depth and complexity with an intense blackberry flavour and firm tannins. Morgante also benefits from the expertise of that roaming oenologist, Riccardo Coltarello, who he says gave him the confidence to believe in Nero d’Avola. The indigenous white varieties of the island are no less intriguing. Catarratto, Inzolia, Greco and Greccante were grown for Marsala, with little attention paid to their vinification, as any faults would be lost in the vinification and fortification process. Nowadays producers like the Rallo family at Donnafugata, who used to make Marsala, are showing what can be achieved as table wine. Their Vigna di Gabri is a delicately understated, lightly nutty white wine, while Chiaranda’ del Merlo, made from Chardonnay as well as Ansonica, is more international in flavour, with some oak ageing. Rapitalà, the leading estate for Bianco d’Alcamo, produces three white wines, including pure Catarratto, and two Chardonnay Catarratto blends, one with oak and one without. For my tastebuds, there was no contest; the pure Catarratto – without a hint of oak – won easily with its soft, grassy fruit and gentle aroma. Research has revealed three clones of Catarratto, normale, lucido and extra lucido. The normale has high sugar levels and lower acidity, and seems fatter and more structured, while extra lucido has higher acidity, less sugar and slightly more aroma and lucido comes somewhere between the two. The DOC of Etna is centred on the slopes of the volcano and allows for even greater originality. Here the growing conditions are quite different, not only with the volcanic soil giving intensely mineral notes, but also with a much higher rainfall than on the rest of the island. This allows for grape varieties not found elsewhere, such as Carricante and Minnella for white wine, and Nerella Macalese and Nerello Cappuccio for reds. The potential of Sicily is also exciting outside interest. The flying winemakers have come here, with Kim Milne helping Firriato to make more internationally flavoured wines from blends of indigenous and international varieties. The large Calatrasi winery, producing a range of indigenous and international blends, is run by an Australian called Brian Fletcher. Most successful is the pure Catarratto under the Terre di Ginestra label. There is also interest from other parts of Italy; northern Italians recognise the cultural difficulties in “doing your own thing” on this individualistic island, so that among others, the Valpolicella producers, Pasqua, have a joint venture with the Fazio family. And in reverse, Sicilians are interested in grape varieties from elsewhere in Italy. Planeta have planted Fiano, a grape variety more commonly found in Campania. They believe that Italian grape varieties will gain greater world wide acceptance and their first release of Cometa, a pure Fiano, is indicative of this trend. But the fact remains that just 10% of Sicilian wine production finds its way into bottle, and 65% of the vineyards are still planted with high-yielding, flavourless Trebbiano for the domestic market. The wine will be packaged like a milk carton and sold for less than 1000 lire (32 pence) a litre. But even the cooperatives, the most traditional part of the industry, are waking up, with Settesoli and Cellaro obtaining EU subsidies for new investments. For this they have to match the grant with a similar sum of their own. Each year in Sicily brings new producers who are converting from vino sfuso to selling their wine in bottle. The potential of this ancient island is truly fantastic.